Green Suede Shoes remembers three decades of a lost New York, and celebrates the music and song in which it now lives. This rock 'n' roll Angela's Ashes begins in County Wexford, Ireland, in the late 1950s, a now unrecognizable, priest-fearing backwater suffocating in superstition and strangled by sexual fevers. After an escape to the Bronx, Larry finds himself, like a musical Zelig, side by side with the Ramones and Blondie at CBGBs; the brothers McCourt, Lester Bangs, and Nick Tosches at The Bells of Hell; the Guinness soaked regulars of Paddy Reilly's; Cyndi Lauper while she ascends and burns; Joe Strummer, Rick Ocasek, Neil Young, and Shane McGowan. The shootings at the Academy and the tragic death of soundman Johnny Byrne punctuate the revels and excesses and presage the gloom cast by 9/11 and the loss of Father Mychal Judge and so many friends. 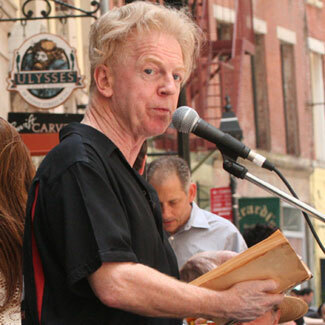 Larry Kirwan (born in Wexford, Ireland) is an expatriate Irish writer and musician, most noted as the lead singer for the New York based Irish rock band, Black 47. Prior to Black 47, Kirwan and fellow Wexfordian Pierce Turner were the house band in Malachy McCourt's Bells of Hell in Greenwich Village. The music was an amalgam of Folk, Trad, Progressive Rock, Punk, and any other genre that came to mind. The group was one of the few banned from CBGB's; in the words of Hilly they were "too demonic." However, all was forgiven for they played a number of times at the club thereafter. They then led the new wave band Major Thinkers for some years. Their song, Avenue B (is the place to be) became a radio hit whereupon they were signed to Epic-Portrait Records. They recorded an album, Terrible Beauty, that was never released and went their separate ways after a somewhat memorable performance in Irving Plaza on St. Patrick's Day, 1985. Kirwan has also written and produced eleven plays and musicals, many of which have been performed in the United States and Europe. The plays deal with many topics including Irish history and politics. The most popular however is Liverpool Fantasy, a "what if" the Beatles had broken up while recording Please Please Me and never made it. Kirwan formed Black 47 with Chris Byrne in late 1989 after a jam in Paddy Reilly's Pub in Manhattan. Since April 2005, he has hosted Celtic Crush, a radio show on Sirius Satellite Radio that features Celtic artists from a wide variety of genres. He also writes a weekly column for the Irish Echo. He has had three books published, a novel version of Liverpool Fantasy; Green Suede Shoes, a memoir, and Mad Angels a collection of plays. A new novel, Rockin' The Bronx, will be published in Feb. 2010. He is currently collaborating with Thomas Keneally on a musical, Transport. He is a naturalized U.S. citizen, having emigrated in the 70's.